The Riding School, Castle Road. Castle Road was known as "The Hollows" to our forefathers and is made out of a secondary road which connected the early primitive road, now represented by Hounds Gate, with the footpath which led over the Meadows to Wilford Bridge. It seems to occupy more or less the position of part of the great dry moat which in Edwardian times was constructed to surround the final outer bailey of Nottingham Castle and even today it remains very deeply sunk between the cliffs upon which Jessamine Cottages stand and the original level of the Castle platform. The walls and bastians defending the Castle still frown down upon Castle Road, but they are not particularly interesting as they were so tremendously restored as to amount almost to a re-building about 1900 under the late Mr. T. G. Jackson moreover they are not actually upon the mediaeval foundations for a portion of the wall was taken down in 1798 to make room for the Riding School which has now disappeared. There are, however, a few ancient stones and foundations here and there from which it is possible to make an imaginative picture of the importance of this great fortification. The Riding School itself which was pulled down in 1926 was a somewhat ugly structure which very much impeded the view of the Castle. It was originally a comparatively small building being merely 35 yards by 15 yards and it was opened in 1799 and was used as the Riding School and Drill Hall for the Yeomanry who played so important a part both in the civil and military life of the period. The building was opened with considerable ceremony and a great function was made of the presentation of colours to both cavalry and infantry volunteers. At the conclusion of the parade a great public dinner was held in the course of which a good many speeches were made and it is interesting to note that in his remarks the Rev. Beaumont who was the Chaplain to the Yeomanry said that there had been seventeen riots in Nottingham in seventeen years and that he hoped that the formation of the Yeomanry would have something to do with the suppression of these riots. 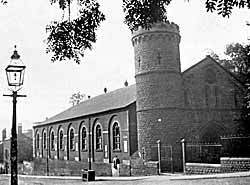 The building was enlarged in 1874 and a somewhat elaborate front of Bulwell stone was set up facing north. These alterations were made under the direction of the late Mr. R. F. Evans and the building was then used as a drill hall for the Robin Hood Rifles. It gradually however, fell into disuse and became unsafe and decrepit and was completely destroyed. During its history it seems to have been put to a good many uses in ways not contemplated by its founders. For example, during the 18th century we find complaints that it was used as a sort of circus for the exhibition of horsemanship by wandering bands of performers, who in addition to their activities as entertainers, were very prone to act as distributors of debased coin and after their departure the town was frequently found to be left in possession of a good deal of this undesirable money. It was useful for the Post Office during the latter years of its existence as it was used as an extra sorting station during Christmas and other periods of severe postal traffic while towards the end of the Great War it was used as a sort of dump for considerable quantities of food. There is a curious note that in 1815 while some stables were being constructed at the rear of the Riding School, a public house of Charles I's time which had been erected within the ditch and the yard south of the Castle gatehouse was pulled down and that Mr. Stretton, the well known antiquary, descended into the cellars. There seems to be no trace whatever of this nowadays. Jessamine Cottages, Castle Road, were swept away by major redevelopment of the area in the 1950s. In 1825 the house now used as Vicarage for St. Mary's and St. Peter's Church was occupied by a certain Mrs. Youle who is interesting as being one of the last ladies in Nottingham to keep a private sedan chair. She was carried about the town by two footmen and the portion of their livery of which she was most proud were their spotlessly white stockings which seem to have afforded her a tremendous amount of satisfaction. 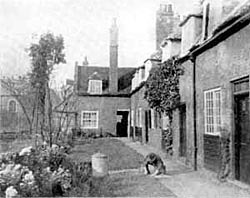 On the east side of Castle Road is that charming little yard and terrace nowadays called Jessamine Cottages, but known to our forefathers as "Old Workhouse Yard." In 1725 the land was leased to the parish of St. Nicholas for a period of 999 years for the purpose of erecting a workhouse upon it, but the building was not commenced until 1729 when the present edifice was constructed. It remained the parish workhouse until about 1815 when a new workhouse was erected for the parish at the corner of Chapel Bar and Park Row and the old workhouse was divided up into tenements and after receiving other alterations was let out as cottages. It is an extremely beautiful and peaceful little area and is very well seen from the grounds of the Castle.